Living by the main principles of sustainability and energy efficiency has become, and is still becoming, very important in modern day life. The importance of living green is stronger than ever since our environment suffers when we consume too much energy, create too much waste, and consequently pollute the air, soil, and water. One of the ways we can take care of our environment and contribute towards improving its quality, is trying to live green and making our homes more sustainable. Reduce, reuse and recycle, are the three most important principles (in that order) are the three Rs of sustainability. When it comes to sustainable and green living, the main goal is to reduce energy consumption and pollution. This can be done in several ways by using repurposed and reusable building materials. Great amounts of energy are inevitably used in the production of new building materials, which emits a lot of pollutants into the air. By reusing materials, we decrease the need to produce new materials and lessen the impact on the environment. Materials we no longer need should be recycled, repurposed, or donated for reuse. Apart from saving invaluable resources and helping create a more sustainable environment, these practices will also save you money since it is cheaper to reuse than to buy something new! Here are some ideas for projects using reusable material in your home. 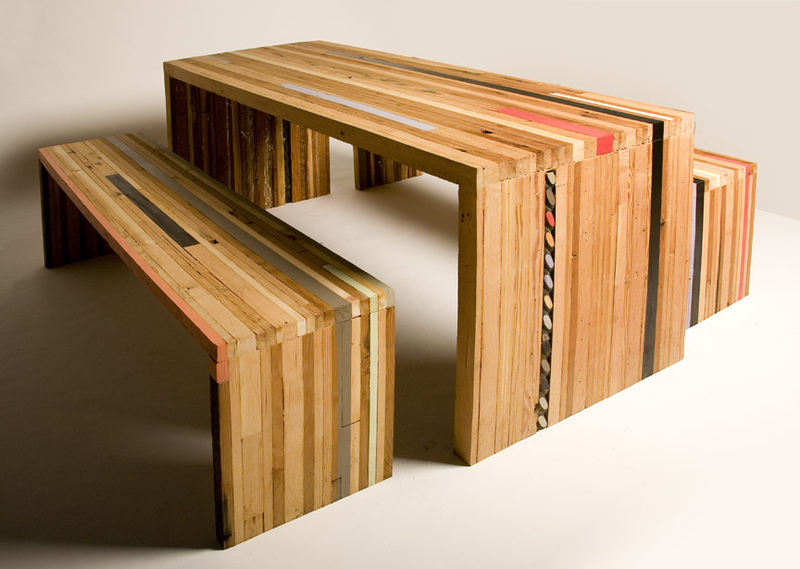 When it comes to wood there are many possibilities for reuse to create something new for your home. You can shop at the ReBuilding Center or similar salvaged lumberyard and depending on what you are searching for and what your project is going to be, you can choose your own sizes and dimensions. Re-do your own flooring or use some beautiful old growth in a custom-made furniture project. And remember when redoing your floor, make sure to recycle it if possible because the possibilities for reuse are endless! If you have some old wooden wardrobes, cabinets, or furniture that you're looking to get rid of, give them new meaning through a creative reuse project. If those pieces of furniture have drawers, for example, you can repurpose them into little tables for your living room, patio, or garden. At the ReBuilding Center, you can reusable window frames and shutters and there are many ways you can use them to turn into a DIY project. An interesting addition to your kitchen would be to turn an old window into a hanging rack for your pots and pans. Attach a firm, vintage window to the ceiling and simply add some hooks to it and you will have an innovative pot rack, and it will free up some space in your kitchen. Old window frames can also be repurposed as photo frames. Put your favorite photos in between the frames and attach it to the wall or display it anywhere in your home. Old tiles are usually thrown away when being replaced with new ones or when they are broken, but they can definitely be repurposed. Don't throw them away! Broken and scrap tiles can be used to collage on to colorful flower pots or garden walkways for example. You can have some fun creating a mosaic, designing it in way you want, and adding a personal touch to your outdoor space. Many, if not the majority of the things we own can be donated to your local reuse store or reused in your own DIY project. By living more sustainably, we help improve our planet and quality of life while saving money, having fun, being creative, and contributing to a reuse economy! This article was written by Matt, writer and editor for roofing contractors from Georgia. Newer PostCheer RBC on in Design & Build Competition, "The Dropbox Derby"
Older PostLast, Last Thursday of the Summer!